In a time of uncertainty, Mary and Joseph gathered what they had and traveled to Bethlehem to be counted in the census. What would they eat? Would they be warm? What did they need for themselves & their baby? The idea of a 'Reverse Advent Calendar,' where families are encouraged to give rather than to get, has been making the rounds on social media. 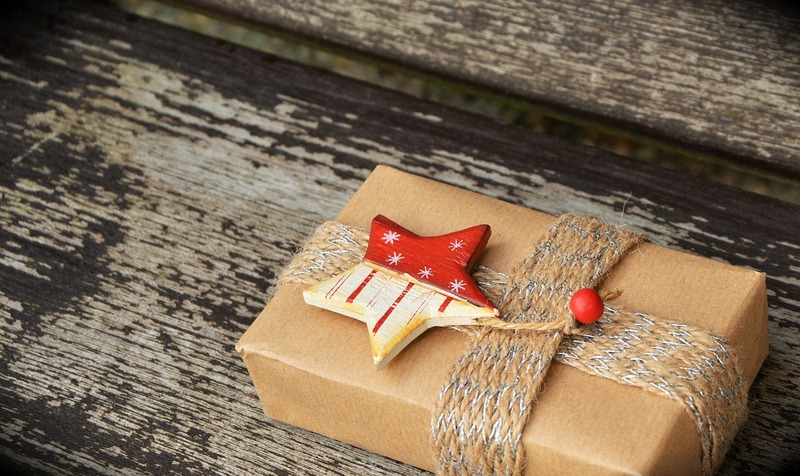 How do we take this terrific idea - giving to those most in need during a season in which we celebrate a lowly newborn - and make it both meaningful and less stressful during an overloaded time of year? 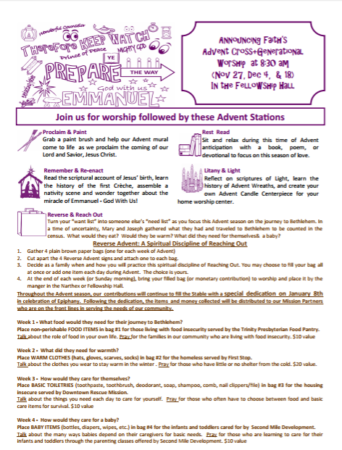 Worshipers at Faith Presbyterian were invited to participate in creating their own Reverse Advent Calendars during our 8:30 worship. 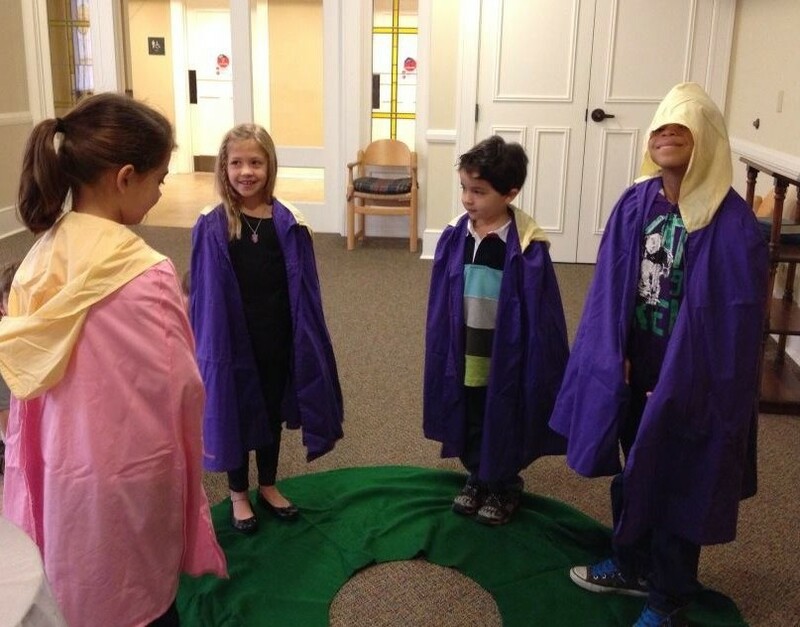 For three Sundays, we celebrated with interactive worship at Advent stations set up around the room for folks of all ages to explore. Read and reflect on different translations of the story of Mary and Joseph in Bethlehem. Pause to wonder about the lives of Mary and Joseph. What would they eat? Would they be warm? What would they need to care for themselves? What would they need to care for a newborn baby? Create tags for each of 4 brown paper bags. Each week, fill the bag for the corresponding service agency: Food for week 1, warm clothing for week 2, toiletries for week 3, and baby items for week 4. You'll note these correspond with the wondering questions, above. These cards have conversation and prayer starters and a suggested monetary amount. A card describing the service agency and its connections to Faith Presbyterian is also available for each brown bag. Pray. Decide as a household how you will fill your bags. Will you donate money? Will you fill it each night as you light your Advent candles? Once a week when you do your grocery shopping? Reverse and Reach Out adds layers to a good idea, creating a focal point for home devotion. Scripture and the wondering questions help families understand the humanity of the Holy Family. Connecting their needs to those of our community highlights the humanity of all of God's children. The visual impact of four brown bags sitting together make a statement in houses filled with holiday color and glitter. While we decorate with "stuff" - for some there is only a brown bag to hold their possessions. What I've found in my ministry is that busy families want to deepen their faith and they want something they can manage, rather than something that they will get behind on, give up, and feel badly about. I like to create options so that each family can make it their own. 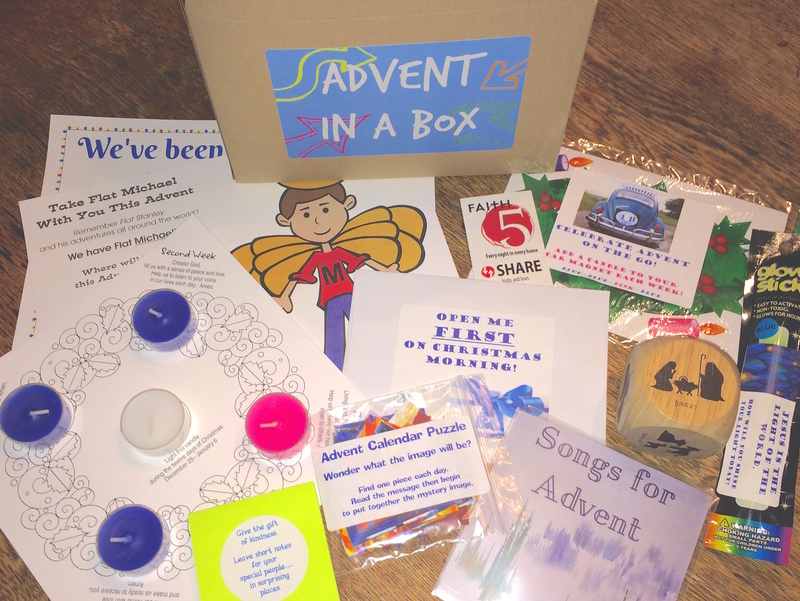 Deciding together how they will use the Reverse Advent Calendar allows families to reach out in ways that work for them. As a community, each household reaches out in their own way, but we come together as a church family to bless our gifts before they are brought to the service organizations. 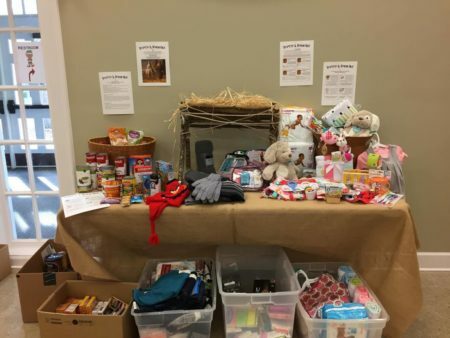 Parishioners are encouraged to drop off their gifts at the Reverse and Reach Out station in our parish hall every week. Our collected gifts will be dedicated on January 8th. 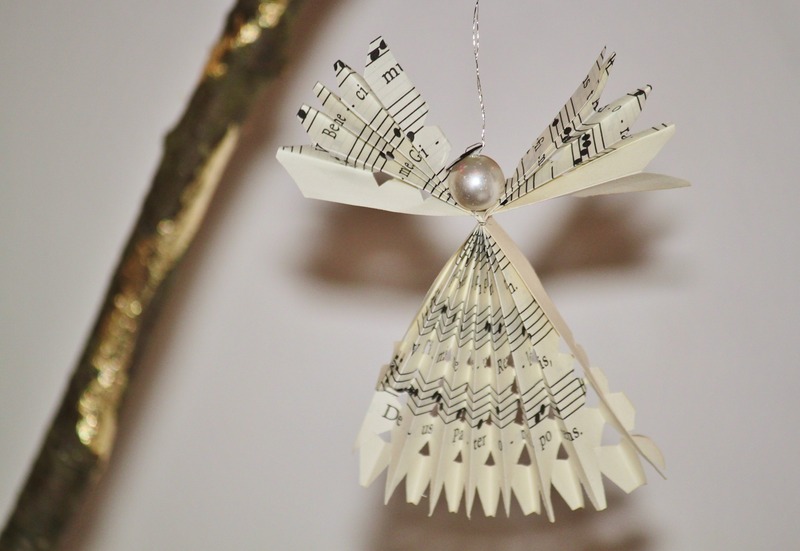 By waiting until after Christmas, families can continue to give through Epiphany, connecting the waiting of Advent to the birth of Jesus and on to the celebration with the Magi. The people of Faith Presbyterian have taken Reverse and Reach Out to heart. The station now is overflowing with donations from a most generous congregation that has embraced mission with their heart and soul! Krista Lovell is a PCUSA Certified Christian Educator who has served congregations for the past 35 years in a variety of ways to share God's Story of abundant love and grace. She currently resides in Huntsville, AL where her time is split between her woodworking business Generation to Generation and her part-time job as Mission Coordinator for Faith Presbyterian Church. She is a pastor's wife, mother of three, and grandmother of one very special grandson!